A police officer and three other people were shot and killed when a domestic dispute at a bank escalated into shootings at three locations in northern Wisconsin, investigators said. WISCONSIN: A police officer and three other people were shot and killed when a domestic dispute at a bank escalated into shootings at three locations in northern Wisconsin, investigators said. A suspect was in custody. The shootings happened on Wednesday afternoon at a bank, a law firm and an apartment complex, where officers, including a SWAT team, had a standoff with the suspect for several hours before ending in a volley of gunfire around 5 p.m. Authorities took no questions in a brief news conference late on Wednesday and gave no details on the four victims or suspect. They said that there was no remaining threat to the public. Jason Smith, a deputy administrator for the state Department of Justice's Division of Criminal Investigation, said more than 100 officers were investigating and more information would be released on Thursday. The violence unfolded in a cluster of small towns south of Wausau, about 90 miles west of Green Bay. The officer worked for Everest Metro, a small, 27-officer force that serves Schofield and Weston. "I would like to send all my thoughts and ask everybody listening, 'Thoughts and prayers to all the victims and their families,'" Everest Metro Chief Wally Sparks said. "Please keep them in your prayers and be with our officers." The first shooting was reported shortly after midday at Marathon Savings Bank in nearby Rothschild. Officers responding to a reported "domestic situation" at the bank arrived to find two people had been shot. They said the suspect was gone when they arrived. A second call came about 10 minutes later from the Tlusty, Kennedy and Dirks law firm in nearby Schofield. The third shooting happened at 1:30 p.m. at an apartment complex in Weston. A woman who lives in the complex said she looked out her apartment window at the complex about 1:15 p.m. to see a squad car approach, and a few seconds later heard a gunshot and saw the officer fall. 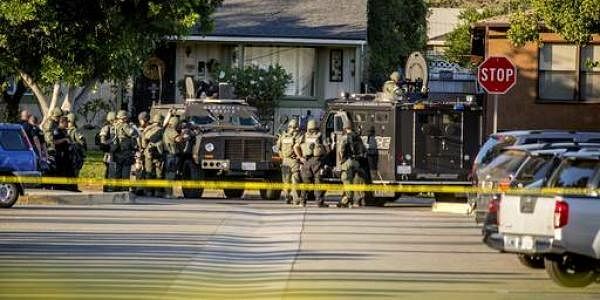 Kelly Hanson, 21, told The Associated Press she saw other officers put the wounded policeman in an armored SWAT vehicle and take him away, but she could not tell if he was alive or dead. "I thought, what is going on? I know what a gun sounds like, and thought 'This isn't good,'" Hanson said. She said she stayed in her apartment until about 4:45 p.m. when she heard a volley of about 10 shots and began to "freak out." Authorities eventually let her leave her apartment. "It's tragic that had to happen, but I think they did a good job out here today," Hanson said. SWAT members entered the apartment building about 2:30 p.m., the Wausau Daily Herald reported. Nearby schools and a hospital went on lockdown. The lockdowns were later lifted. Susan Thompson, a resident of the building, told the newspaper she heard gunshots and heard someone scream. As she left her apartment, police called to her to get inside and lock her doors. Thompson, 21, said she had her 2-year-old daughter in the apartment. Officers later came to her door and helped her and her daughter outside, she said. Omar Sey, 31, who said he had just moved to the apartment complex, learned of the shooting after he arrived home to find dozens of squad cars outside. Sey, who said he had moved to Wisconsin from Gambia, said he didn't understand why such things happen in America. "This is crazy," he said. "You have everything at your disposal. Why don't you make your life better instead of engaging in this?"